Growing up, Halloween was one of my favorite holidays. My mom usually made my costumes and I always looked forward to trick or treating with my friends. As I started getting older, Halloween started to lose some of it’s appeal but becoming a mom changed that again. Granted, I don’t always look forward to Halloween in terms of dealing with trick or treaters, but over the past few years I’ve started to enjoy it more. I’d love to start really decorating for Halloween again but in the meantime, I have fun planning ahead for Halloween. 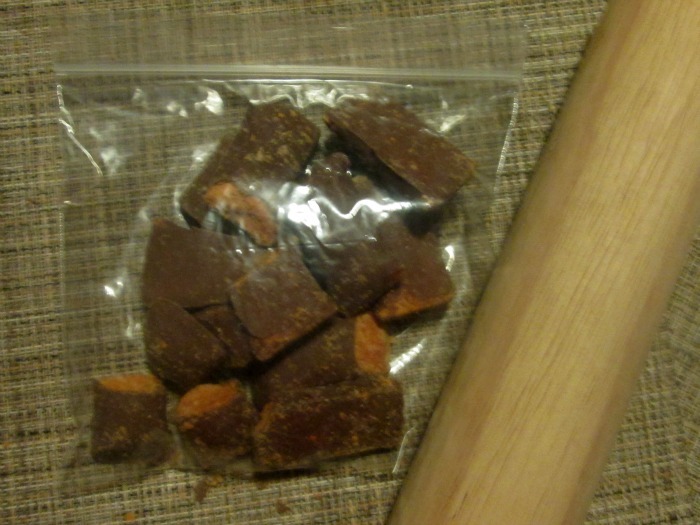 We usually set aside a night to fill treat bags for our trick or treaters and to keep the spirit going, I’ll make special Halloween themed treats for us. This year, I’m making a crushed candy cupcake for us and possibly for Sweet B’s Halloween party at school. Both during treat bag assembly and Halloween night, I also want to have a quick and easy meal on hand. We try to cook homemade whenever we can, but I won’t deny that sometimes getting a frozen pizza is just what we need. 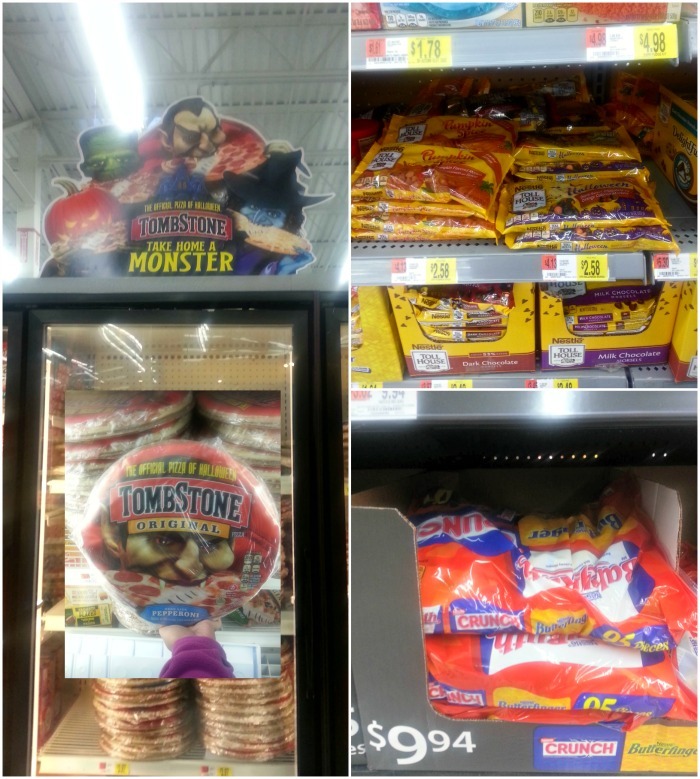 This year, we’re stocking up on TOMBSTONE® Original Pepperoni for our quick, Halloween meal. For our pre-assembled treat bags, I put four to five pieces of candy in a treat bag, staple the treat bag shut and then put it in my reusable bag so I can hang that on the door. Then, once we start getting trick or treaters, all I have to do is reach into my bag of my treats. This year, we’re treating our trick or treaters to NESTLÉ Jumbo Assorted Fun Size Candy. When we were shopping for candy and picking up pizza at our local Walmart, I also got the inspiration for my crushed candy cupcake. I love to bake and while baking from scratch is my preferred, I’m not above taking some shortcuts. Boxed mixes make it easier, especially when I’m making a larger batch. We happened to pass by their seasonal baking station and while I was looking for Halloween themed cupcake wrappers, I spotted NESTLÉ® TOLL HOUSE® Morsels. I thought those might make a great addition to the cake as well, so into the cart they went. After getting a few more things for the week, we were ready to head home so I could start assembling treat bags… and make those tasty crushed candy cupcakes. While the pizza was cooking, I started my preparations for my cupcakes. 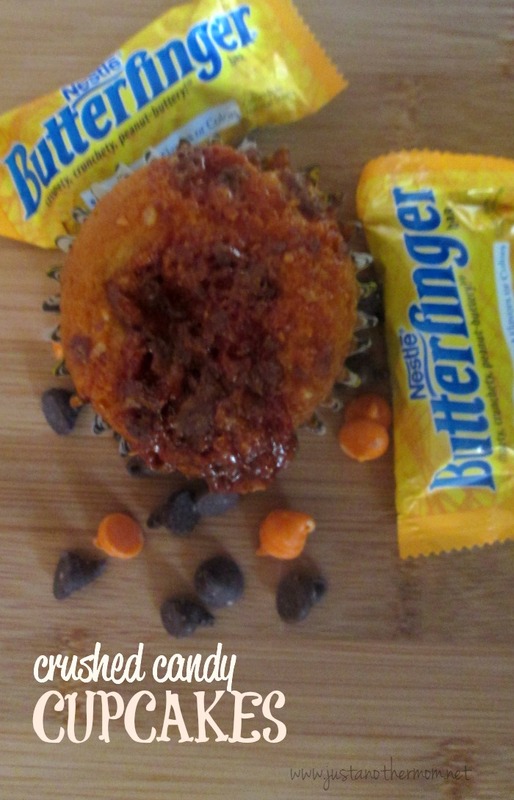 Did you know that Butterfinger candy is gluten free? I discovered that after looking at the back of the package of candy! With a few adjustments, these cupcakes could even be gluten free. This particular recipe isn’t, but when I make these for Sweet B’s school I might try to make them gluten free. We’ll see what we see. One of my favorite parts about making these crushed candy cupcakes? Crushing the candy. And no, that’s not a reference to the game… I just enjoyed crushing the candy. Some types of candy will probably work better than others (for example Butterfinger, Crunch bars instead of Baby Ruth) but really it’s up to you. 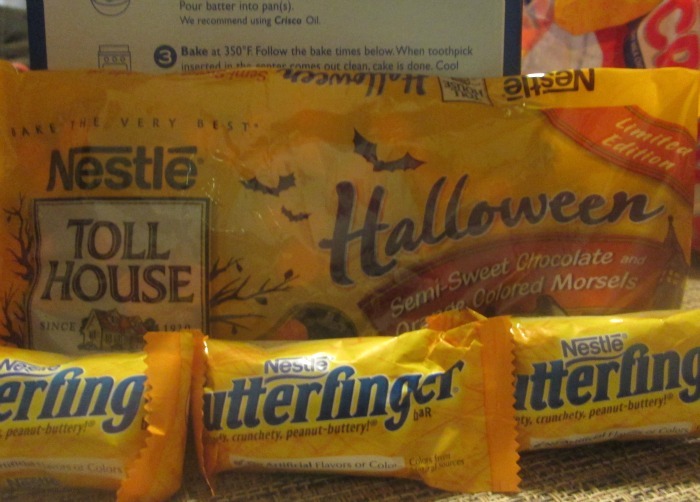 I opted to go with Butterfinger because well, they’re delicious and one of my favorite types of candy. Now, I will add, because you’re making these with candy bars, use your discretion when it comes to adding in those tasty morsels. Depending on the age(s) of your child(ren), they can make this with little supervision and/or adult help. I really do think that these crushed candy cupcakes will become a part of our yearly Halloween tradition. They were so easy to make and delicious to boot.